Since 1986, Hartland Overhead Door has provided: • Excellence and quality in Garage Doors & Openers • Superior Installation & Service • A full one-year labor warranty on installations • Personal Attention & Professional Service Hartland Overhead Door offers cutting-edge technology with a personal touch. We pride ourselves in using only the finest brands of garage doors available. 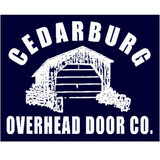 Please call or email us to schedule an appointment, and let us show you why Cedarburg Overhead Door has been Ozaukee, Washington & Northern Milwaukee Counties' number one garage door sales and service providers since 1984! 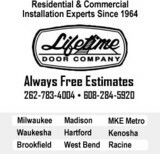 Family-owned and operated since 1964, Lifetime Door Company specializes in garage door repair, emergency and installation services by highly experienced and Certified Trained Technicians at an affordable rate. *Authorized Clopay Dealer* There is no place like home. Whether you're building a new home or remodeling the home you are already in, Consolidated Doors has a full line of the industry's highest quality products - garage doors from Clopay, LiftMaster garage door openers (door operators) and entry doors - that will add style to your home. We will also install your garage door for you. We are your full service, residential, commercial and industrial garage door company. Consolidated Doors offers competitive pricing due to our ability to manufacture and assemble garage door components in-house. Above all, it's the people behind the product. From your initial meeting with us to the final installation, your experience with the Consolidated Doors team is what counts. We pride ourselves on detailed communication, quality installation, and friendly service. We are focused on our garage door business and it shows. 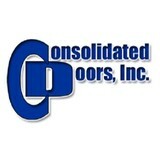 You will be confident when you buy from the experienced, friendly, reliable team at Consolidated Doors. ADAM Overhead Door is truly a family business. 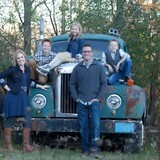 In fact, ADAM, are the intitials of our family members. The first A is for our oldest daughter Amanda, the D is for Dawn my wife, the second A is for Amy our youngest daughter, and the M is for me, Mike. The goal is for someday the kids taking over the company. I have over 25 years experience in the door business. There isn't much out there that I haven't seen because of that experience. We are knowledgeable enough to find a door for just about every opening. We service the entire Milwaukee Metro area from Kenosha to the south, Watertown to the west, and Port Washington to the north. We repair all types of overhead doors and openers along with side entry doors. We handle any and all types of overhead doors, from basic steel Non-Insulated Doors to the high end custom Cedar and Wood Doors. We also furnish and install steel pre hung doors. That's why we tell everyone "If you don't get an estimate from us you might pay too much!" Our service is our way of life, we're not satisfied until you are. Estimates are always free and we offer discounts to Veterans and Seniors. Many of our models offer a Lifetime Warranty on the entire door inluding the hardware and springs. It is absolutely the best warranty in the garage door business. For fast, affordable Milwaukee garage door installation, service, and repair, call D&G Garage Doors & Openers. Our expert garage door service experts are available 24/7 to provide garage door repair, installation and maintenance services throughout the Milwaukee area. D&G Garage Doors & Openers is a family-owned and operated company that has been in business for over 40 years. With decades of garage door repair and installation experience, we have the skills and experience needed to provide fast, dependable garage door services. Whether you are shopping for new garage doors as part of a home remodel or you need fast, emergency services to fix a broken garage opener, our garage door service experts can help. What kind of services do Sheboygan Falls, WI garage door dealers and installers provide? Find garage door sellers and installers in Sheboygan Falls, WI on Houzz. Narrow your search for Sheboygan Falls, WI garage door sellers and installers by selecting the nearest city or zip code. Look at portfolio and product photos, and read reviews to find the best Sheboygan Falls, WI garage door professional for your home.